While the joint hires between the University of Missouri and the Donald Danforth Plant Science Center will serve as a bridge for extended opportunities for collaborations, the two institutions are already making an impact with two important grants through the National Science Foundation. The grants total nearly $5 million. It was four years ago when the University of Missouri and the Donald Danforth Plant Science Center entered into a collaborative agreement that would lead to the hiring of four new researchers, each of whom would enhance the plant biology research not only in the state, but also across the globe. Three of those positions are now filled, with the recent additions of R. Keith Slotkin and Bing Yang, joining Blake Meyers, who was the first collaborative hire in 2016. Blake Meyers’ (left) research focuses on genome-scale studies of ribonucleic acid (RNA) and … Expand ▸Blake Meyers’ (left) research focuses on genome-scale studies of ribonucleic acid (RNA) and components of RNA silencing pathways. His recent emphasis has been on plant reproductive biology and fertility, with the main work of the lab on the evolution and function of plant small RNAs. Before the formal agreement for joint hires, MU and the Danforth Center were already familiar with each other. Several Danforth scientists are adjunct professors at Mizzou, and the two institutions had collaborated on various grants as well. The joint hires were part of a push for several targeted and strategic hires in plant biology at MU. All of the hires would be Mizzou professors, but with two to be located at the Danforth Center and two at Mizzou. “These were strategic hires targeted toward specific scientists who could choose their academic home, so there was an obvious role for the campus-wide IPG to play in their recruitment,” Sharp said. Meyers, whose MU appointment is as a professor in the Division of Plant Sciences, was on the initial shortlist of individuals MU and the Danforth Center wanted to bring in. Meyers was serving as the Edward F. and Elizabeth Goodman Rosenberg Professor in the Department of Plant and Soil Sciences at the University of Delaware before taking the first of the four positions. Meyers’ research focuses on genome-scale studies of ribonucleic acid (RNA) and components of RNA silencing pathways. His recent emphasis has been on plant reproductive biology and fertility, with the main work of the lab on the evolution and function of plant small RNAs. Slotkin’s (left) research centers on the area of epigenetics – understanding how plant cells … Expand ▸Slotkin’s (left) research centers on the area of epigenetics – understanding how plant cells determine which regions of their DNA should be active or repressed. Slotkin said if you think of DNA as a blueprint or instruction booklet, epigenetics serves as the legend that informs you how to use that blueprint. Slotkin officially began on August 1; Yang began on September 1. Slotkin will serve as an associate professor in the Division of Biological Sciences. Yang’s appointment is as a professor in the Division of Plant Sciences. 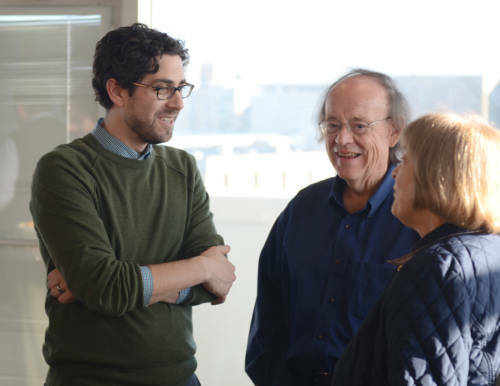 Slotkin’s research centers on the area of epigenetics – understanding how plant cells determine which regions of their DNA should be active or repressed. Slotkin said if you think of DNA as a blueprint or instruction booklet, epigenetics serves as the legend that informs you how to use that blueprint. 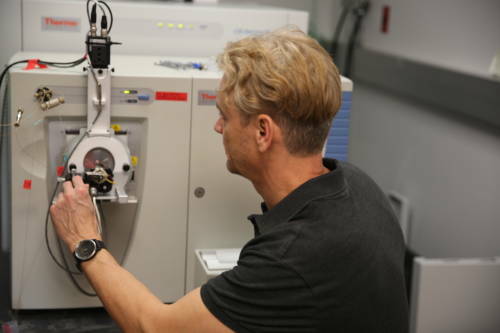 Slotkin was an associate professor in the Department of Molecular Genetics at The Ohio State University before joining MU and the Danforth Center. Bing Yang is the first of the joint hires to be housed at MU. His research focuses on advanced … Expand ▸Bing Yang is the first of the joint hires to be housed at MU. His research focuses on advanced biotechnologies that provide genetic and molecular tools to help with the basic understanding of plant biology. 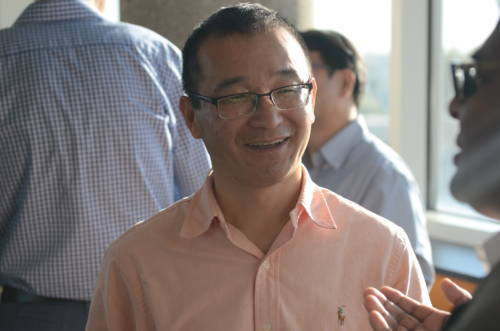 Yang served as an associate professor in the Department of Genetics, Development and Cell Biology, College of Liberal Art and Sciences at Iowa State University. His research focuses on advanced biotechnologies that provide genetic and molecular tools to help with the basic understanding of plant biology. Yang is the first of the hires to be housed at MU, and is located in the Bond Life Sciences Center. Meyers and Slotkin are both located at the Danforth Center. 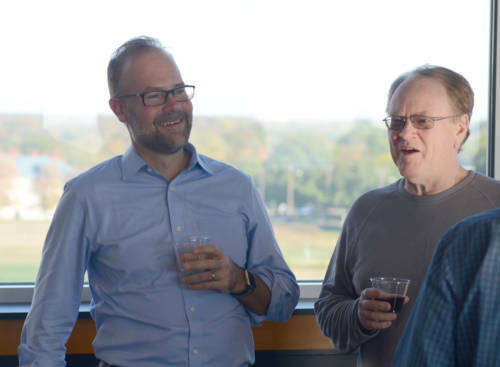 While the joint hires will serve as a bridge for extended opportunities for collaborations, MU and the Danforth Center are already making an impact with two recent grants through the National Science Foundation. The grants total nearly $5 million. 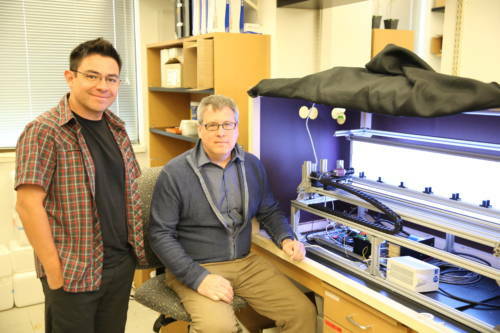 When David Mendoza-Cozatl joined the University of Missouri in 2011, he began researching how plants accumulate nutrients. While Mendoza-Cozatl was primarily interested in how nutrients move within plants, he happened upon another discovery – how plants sense nutrients, like iron. David Mendoza-Cozatl is working with Scott Peck (left) and Dmitri A. Nusinow (on computer screen) on … Expand ▸David Mendoza-Cozatl is working with Scott Peck (left) and Dmitri A. Nusinow (on computer screen) on the grant. Peck is a professor of Biochemistry at MU. Nusinow is an assistant member and principal investigator at the Danforth Center. Mendoza-Cozatl is the principal investigator on the grant. Peck and Nusinow are co-principal investigators. 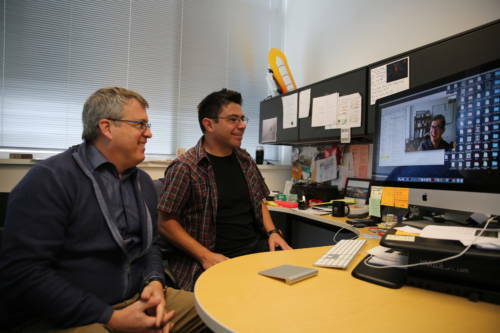 Mendoza-Cozatl and Nusinow know each other from their work as post-docs at the University of California, San Diego. Traditionally, it was thought that iron sensing happened in the roots of the plant. The roots are in close contact with the iron sources in the soil, making it seem as though the sensing would happen in that area. Preliminary data found in Mendoza-Cozatl’s laboratory, and other laboratories, shows that iron sensing also happens in specialized cells, known as companion cells, located in the leaves. “There are some dead tubes inside the plant, xylem, that help move nutrients and other molecules from the root to the leaf,” Mendoza-Cozatl said. “These tubes move things in only one direction, meaning the items only go from the roots to the leaves. But, there are other tubes that are alive, phloem. Those tubes move more complex nutrients, such as sugars. As a live tissue, the tubes need a helper to load things in. Companion cells are attached to the tube and help move the items for long-distance transport. You can also think of them as loading cells. Mendoza-Cozatl is working with Scott Peck and Dmitri A. Nusinow on the recently-funded grant from NSF. The awarded amount is nearly $1 million. Peck is a professor of Biochemistry at MU. Nusinow is an assistant member and principal investigator at the Danforth Center. Mendoza-Cozatl is the principal investigator on the grant. Peck and Nusinow are co-principal investigators. Mendoza-Cozatl and Nusinow know each other from their work as post-docs at the University of California, San Diego. 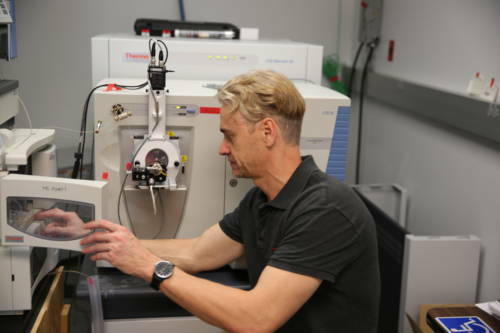 The goal of the research is to identify the mechanisms responsible for iron sensing and homeostasis in plants. It’s vitally important that plants be able to sense the amount of iron and regulate it, mainly to avoid overload and cell damage. The goal of this grant is to identify the mechanisms responsible for iron sensing and homeostasis in … Expand ▸The goal of this grant is to identify the mechanisms responsible for iron sensing and homeostasis in plants. It’s incredibly important that plants be able to sense the amount of iron and regulate it, mainly to avoid overload and cell damage. David Mendoza-Cozatl (left) is serving as the principal investigator on the research. He is working with co-principal investigator Scott Peck on the grant. “We know the main sensing takes place in the leaves, and we know the veins are where the magic happens,” Mendoza-Cozatl said. “We’re now looking at where it happens at the mechanistic level. The uptake of iron has to be regulated. Plants can turn it on when they need iron and shut it down when they have enough. We’re looking at the sensing mechanism that is key in all of this. The research has a human health component as well. Iron deficiency in humans affects nearly 2.2 billion people, according to the World Health Organization. Mendoza-Cozatl added that the project will provide training to undergraduate and graduate students on cutting-edge molecular biology techniques and emphasizes collaborative work between students from different disciplines, including computer sciences, biochemistry and plant sciences. Plant oils serve as a renewable source of food, fuels and chemicals – and output of plant oils must double by 2030 to meet projected demand. A good portion of plant oils come from the seeds. Past research has led to improvements in seed oil quality and quantity – but that improvement has led to other issues. Oftentimes, plants bred to produce high seed oil have decreased protein content or make fewer seeds. “Breeders have known for the better part of 50 years that when you try to increase oil, you get a tradeoff of lower protein, and vice versa,” said Jay Thelen, a professor of Biochemistry at MU. “No one really knows what the reason is behind this inverse relationship. A team of researchers led by Jay Thelen, who is serving as the principal investigator, has received … Expand ▸A team of researchers led by Jay Thelen, who is serving as the principal investigator, has received an NSF grant focused on researching why there is an inverse relationship between plant oil and protein. Thelen is serving as the principal investigator on a $3.5 million NSF grant focused on researching the metabolic consequences arising in plants engineered to make higher seed oil, including that pesky inverse correlation. Thelen is working with four co-principal investigators on the grant: Dong Xu, professor of Computer Science at MU; Douglas Allen, USDA-ARS scientist and associate member at the Danforth Center; Abraham Koo, associate professor of Biochemistry at MU; and Philip Bates, assistant professor, Institute of Biological Chemistry, Washington State University. While protein has typically driven the price at market of plant seeds, the demand for oil continues to be on the rise. Thelen said that plant oils are packaged as a chemical structure called triacylglycerol, three fatty acid chains bound to a molecule of glycerol. While it looks simple chemically, Thelen said there are numerous metabolic pathways involved. There is an enzyme that sits at the top of the pathway for fatty acid biosynthesis. Carbon that goes through this pathway must first go through this enzyme. Plant oils serve as a renewable source of food, fuels and chemicals – and output of plant oils … Expand ▸Plant oils serve as a renewable source of food, fuels and chemicals – and output of plant oils must double by 2030 to meet projected demand. A good portion of plant oils come from the seeds. Past research has led to improvements in seed oil quality and quantity – but that improvement has led other issues. Oftentimes, plants bred for to produce high seed oil have decreased protein content or make fewer seeds. Thelen’s lab discovered this new approach to engineer key metabolic steps in this pathway. He was able to then leverage the findings, in a biotechnological manner, to increase seed oil. Allen’s USDA lab at the Danforth Center explores oilseeds that can provide the oil to replace some of our non-renewable dependencies. His research and background were a perfect fit for the grant.